Making money in the cannabis industry is all about drive, professional connections and knowledge of the plant known formally as Cannabis sativa L. The legal cannabusiness has infiltrated into many other ancillary and associated industries, creating new jobs for passionate pot lovers. Average marijuana dispensary pay represents a full spectrum of entry level, management and ownership career possibilities, reflecting different levels of experience and thus, diverse wages. Cannabis dispensaries are the predominant avenue through which consumers purchase products in the legal cannabusiness. Like other retail shops, dispensaries are sometimes nestled into strip malls or flashing neon green plus signs off the highway. In legal states, dispensaries are a part of local culture and lifestyle. The laws of operation for pot shops varies from state to state and within municipalities. In general, dispensaries are broken down into medical shops and recreational shops for adults twenty one years and older. However, when some states pass preliminary legislation legalizing cannabis, the distinctions between the two are often blurred. Dispensaries are increasingly becoming one-stop shops for weed consumers, as stores offer a wide spectrum of products including cannabis flower, concentrates, edibles, tinctures and topicals, not to mention paraphernalia, apparel and novelties. As such, a lot of time and effort goes into making dispensaries run smoothly, as is reflected in marijuana dispensary salaries. 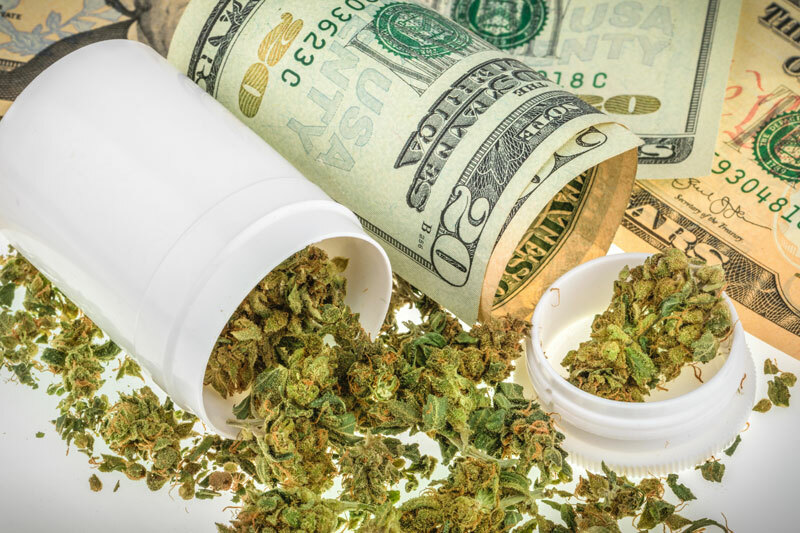 In order to examine average marijuana dispensary pay, it’s perhaps easiest to break down the positions into three categories: entry-level; management; ownership, to represent the range of salaries appearing within one business. When referring to “entry level” dispensary jobs, it’s somewhat of a misnomer. Although the following positions are often considered entry-level, the intense competition surrounding cannabis jobs has made it difficult to acquire beginner positions without previous experience. Working marijuana dispensary receptionist jobs is an ideal avenue for cannabusiness novices to gain entry into the industry. With that said, qualified applicants for this position will require an in-depth knowledge of all things cannabis and cannabis-law related. Additionally, they will likely be expected to have previous experience with clerical and customer service work. Primarily, receptionists greet and check in customers. These employees hold a great deal of responsibility by acting as a main agent of regulatory compliance. All customers must have their IDs checked and entered into online databases to ensure utmost compliance with state and municipal regulations. Additionally, receptionists are tasked with communicating across online forums, over the telephone and in person with customers and company partners. Receptionists often fill-in in areas deemed necessary by managers and supervisors. Average marijuana dispensary pay as a receptionist begin at or above minimum wage. In most regions, receptionist wages begin around $10 per hour with an average of $11-12 per hour. Indeed the most “famous” position in a dispensary is the budtender. Friendly, attentive, savvy – these are a few characteristics that might describe your local weed whiz behind the dispensary counter. With such a diverse array of merchandise at a customer’s disposal, budtenders are charged with assisting visitors in choosing flower strains and other products from the sea of options. Unlike bartenders, budtenders at medical dispensaries must be able to provide accurate suggestions for strains based on the medical needs of the patient. Even in recreational dispensaries, many adults use cannabis both for personal enjoyment and for its medical benefits! More and more, dispensaries expect applicants for marijuana budtender jobs to have held jobs in the industry previously. Finding a job as a budtender can be a tough pursuit since it is one of the more appealing entry-level positions throughout the entire American job market. Candidates who are seriously considering working as a budtender should feel fluent discussing strains and concentrates, laws, regulations and culture. Similar to receptionists and many other entry-level service jobs, average marijuana dispensary pay for budtenders fall just above minimum wage, averaging between $11-12 by the hour. Some dispensaries allow for customers to tip budtenders, however others argue that this reinforces lower hourly budtender wages. If you’re looking for a chill job in the cannabusiness, don’t apply for marijuana dispensary manager jobs. This position requires workers to maintain a high level of responsibility and accountability. In addition to the regular managerial tasks they are assigned, managers must also be constantly ensuring that all employees are following cannabis regulations perfectly. While the exact responsibilities for dispensary managers vary from store to store, these individuals are usually assigned the role of sifting through employee applications, interviewing, and higher new employees. Furthermore, they must then train and lead each employee through daily operations, ensuring their performance is in keeping with business policies. Many dispensary managers fill in where they are needed as budtenders or receptionists, especially when an employee is sick or absent. Managers are expected to handle customer comments and complaints. Involving merchandise, managers take inventory and manage the ordering of products to be delivered to the store. Some managers are responsible for communicating with farms, processors and sales reps to continue doing business together. Unlike positions in budtending and reception, average marijuana dispensary pay in management is competitive. Wages average around $48,000 per year and can reach heights in the higher five figures. All hail the dispensary owner! The entrepreneurs responsible for setting up shop in our towns and cities and providing patients and customers with the weed they want and the cannabis they need. For many, the idea of owning a dispensary is a fantasy that may inspire you to want to pick up and make your way to a legal state; however, dispensary owners know just how difficult it is to become established and make money. The process of obtaining a license to own and operate a dispensary can be arduous and confusing and is definitely expensive. This is why owners often enlist cannabusiness consultants to help guide them through the glut of regulations, to help them figure out how to follow compliance. Dispensary owners come from diverse backgrounds, bust the vast majority have experience in the weed industry and are confident in the changing arena of the cannabusiness. Dispensary owners take on different roles with each store, but ultimately they are in charge of the entire operation. While many people the world over want to purchase cannabis, competition between other dispensaries and hefty startup costs keep some entrepreneurs from taking the leap and opening shop. Average marijuana dispensary pay for dispensary owners have the largest income variation. Owners have been known to make incredible salaries above six figures, while others could barely break even. While being the owner has the highest possible wage outcome of any position in the store, they also have the chance to lose the most. Now that you have a better idea of what the average marijuana dispensary pay is, it’s time to consider applying for a position. there are a number of ways to go about finding dispensaries that are hiring, but there are important things to consider. First, know whether or not you are in a medically legal and/or recreationally legal state. The qualifications to work in dispensaries vary depending on the setup of the store and some states require obtaining a medical cannabis license from a doctor to be eligible. Just like any other service position on the market, generalized job sites like Indeed and Craigslist frequently post ads by dispensaries searching for staff. Spend a half hour reviewing several budtender job ads and you’ll quickly discover some trends in what employers are looking for. Ideally, dispensaries want workers experienced both in service and cannabis, who are reliable and friendly. There are other regulatory requirements based on location as well. It’s all about who you know. The cannabusiness is a community and as such, it reflects equal parts inclusion and nepotism when it comes to jobs. Some employers opt to hire individuals they know or have established credibility with. Especially in the early stages of legal operations, owners don’t want to risk hiring someone who looks good on paper, but is untrustworthy or inexperienced in person. This is why it behooves applicants to establish personal and professional connections with industry workers. Even just getting to know your budtender or receptionist can be a way to separate yourself from the masses. Entire tomes can be written about the wealth of cannabis products now on the market. While most dispensary employees aren’t expected to know every single strain and product, they should be well-versed and able to make easy distinctions from one piece of merchandise to the next. Yes, there are all sorts of consumption methods out there but flower is the hard standard many customers know and love. Flower is broken down into three preliminary strains: sativa, indica and hybrid. Sativas encourage cerebral, energetic highs that may cause some patients to have an anxious response, while indica is more subdued, but is known to cause couch-lock. Hybrids deliver on encouraging effects with elements of both sativa and indica present. From here, the three strains are broken down into many many specific strains created through decades of selective breeding. Each strain is given a name ie: OG Kush, Strawberry Cough, Amnesia Haze and has individual properties that come with unique medical benefits and pleasant effects. Concentrates are taking the weed world by storm. Medical and recreational customers alike are champing at the bit to purchase high quality, potent cannabis extracts. Concentrates are made by extracting essential cannabinoids and terpenes from plant matter using industrial solvents, including CO2 and butane. Since concentrates have particularly high THC content around 65% and higher, they are used by medical patients for more sustained effects and less smoke inhalation over fewer doses. Recreational customers with high tolerances also report that concentrates bring a new dimension to the high experienced. At the same time, concentrates can be intense for some individuals, so dispensary workers must know how to accurately explain the experience. Another form of cannabis intake is through edibles. Customers who can’t or don’t smoke use edibles as their primary way of receiving their medical cannabis. Edibles are created by infusing concentrates into food and beverage products with more accurate dosing than traditional cannabutter infusion. Like concentrates, the effects experienced by eating edibles is different than smoking flower for most people. That’s why even as more methods of consuming cannabis are unveiled, flower will continue to be used by those seeking a specific course of effects. Edibles are very popular in the marijuana circuit, especially with the medical community, and edibles creation jobs are popping up like crazy thanks to the increased demand. Edibles chef salaries no doubt reflect this demand so you can make a pretty good living in this field. If you are a chef by trade and a proponent of marijuana, this might just be your best ticket into this booming industry. CBD Oils are exploding in popularity lately since you can buy them legally in all US states. CBD products have no THC content and no psychoactive effects (meaning they don’t get you high), so they attract a very different kind of customer. You’ll need to know how to work with CBD customers as well as normal dispensary customers. Although the legal cannabis industry is unique in its novelty and progression, it still succumbs to the same restrictions as other highly regulated industries like alcohol and other consumer goods. For this reason, average marijuana dispensary pay will be somewhat at the whim of the market. At the same time, this industry is offering positions that applicants actually want to work! Even if starting wages at dispensaries aren’t as high as you’d like, positions in pot shops allow for employees to advance in their weed career through gaining promotions and making meaningful connections.